Flying a helicopter is a deeply spiritual experience, offering you the opportunity to view nature's glory from a bird's-eye perspective. It can also serve as a source of income if you opt to fly professionally. 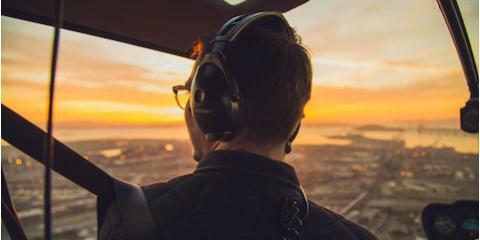 Whether you choose to fly a helicopter for fun or for profit, the road to becoming a pilot begins with getting the necessary training and certification. Listed below are six tips on how to get the process started. To qualify for certification as a helicopter pilot, you normally need to be at least 17 years old, and you must read, speak, write, and understand English. Flight training is required, and you must also pass written, oral, and practical tests. If you are not a U.S. citizen, then you will have to go through a TSA security check before you start the training program. 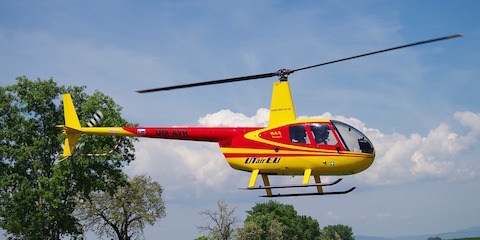 If you already have a fixed-wing pilot's certificate, you can gain certification to fly a helicopter by completing at least 20 hours of training and 10 hours of solo flight, if your training is done using the R22/R44 helicopters. You also need at least a third-class medical certificate. These medical certificates are issued by the F.A.A., and they're designed to ensure you have no health conditions that would interfere with your ability to serve as a pilot. It won't be necessary for you to take a written exam if you already hold a fixed-wing pilot's certificate, but you will need to pass an oral exam and a check ride—a check ride is a test flight in which you are graded by an examiner. The medical certificate is required regardless to acquire an airplane pilot certificate. The student will need the medical certificate only prior to his solo flights. If your pilot's certificate was issued outside the United States, the U.S. Federal Aviation Administration will certify you for flight in the U.S., but you need to meet certain requirements, such as speaking English fluently and holding at least a third-class U.S. medical certificate. The training program is comprised of two parts. The first is aeronautical knowledge, which you can study on your own or take a Ground School program at a flight school. The second part is the actual flight training. You need to complete a minimum of 40 hours of in-flight training, which covers maneuvers, hovering, handling emergencies, cross country flights, and more. The more hours you train, the faster you will improve your skills, and you will need fewer hours to prepare for the checkride. Financing options are available, which will allow you to fly more often. If you complete your training with fewer hours, you can reduce the total cost. When evaluating helicopter flight schools, look for one that emphasizes the effectiveness of your flight training. A proper preparation and briefing towards the flight is an important step, in order to make your flight training more effective. Make sure you are comfortable with the instructor. He is the one who will teach you, guide you, and handle any problems, as well as train you in a variety of different flying environments. Your skill and confidence will improve if your training includes time spent both in open airspaces and those that are more congested. Look for a flight school with experienced instructors and a well-maintained fleet of helicopters. If you want to make a career as a helicopter pilot, choose a school that will allow you to work after completing the training. Join Helicopters Made Easy for an introductory flight, which will provide you with a better understanding of how they operate and train their students. And you can see firsthand just how talented their instructors really are! Some flights will fair better than others, but don’t worry. With the proper guidance and excellent training, you’ll reach your goal—and earn those pilot wings! Based in Farmingdale, NY, Flying Helicopters Made Easy will teach you how to fly a helicopter with training that is both effective and fun. These leaders in flight training provide a modern fleet of helicopters and a team of experienced, highly trained instructors. Call (855) 359-6969 to speak with a flight specialist, or learn more about their services by visiting them online.